Here’s a good technique to soften a strong jawline. Part your hair to one side and..
Here’s a good technique to soften a strong jawline. Part your hair to one side and allow your long fringe to flow freely below your chin; above the jaw will make your face look squared-off. Gather your hair in a loose low ponytail and secure with elastic or leather cuff. Simple and chic! Instead of doing an extreme side part by keeping your fringe low (covering much o.. Instead of doing an extreme side part by keeping your fringe low (covering much of your forehead), sweep it up for a neat look! Do a mini bouffant while keeping the sides sleek. This will balance out angular faces by adding softness and length. This is a preppy look that you can use from day to night. Alice Eve exuded elegance and panache in this bouffant French twist updo! 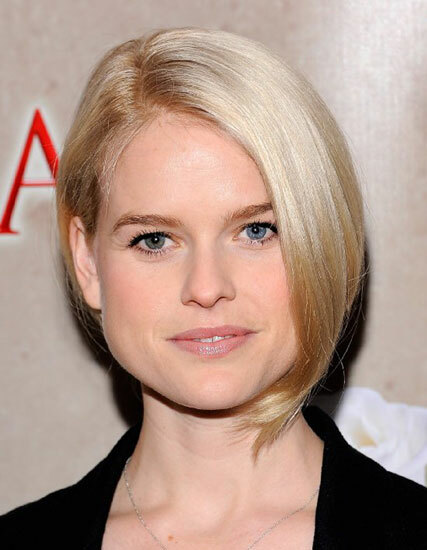 A volu..
Alice Eve exuded elegance and panache in this bouffant French twist updo! A voluminous top is most favorable for women whose jawline are wider than the forehead such as Alice’s. It creates balance on angular faces and softens the overall look. It also adds length while killing unnecessary width. Go edgy with an angled bob hairstyle! The longer perimeter in front is very flatte..
Go edgy with an angled bob hairstyle! The longer perimeter in front is very flattering to women with a strong jaw. To make the edges look softer, ask for razor cut. A bubble half up top will make angular jaw less prominent and it’s also very retro chic!